We're giving away 15 admit-2 passes to see an advance preview of IFC Films' The Journey, starring Timothy Spall, Colm Meaney, Freddie Highmore, John Hurt, Toby Stephens, and Ian Beattie. The screening takes place on Tuesday, June 20 at the United States Institute of Peace at 2301 Constitution Avenue, NW, and starts at 7:30 PM, following a reception at 6:30 PM. In addition to a special start time and venue, contest rules are different too. Please send an email to ifcfilmsdc@gmail.com with your name, email address and (very important) "DC Outlook" in the subject. IFC Films will select 15 winners, and notify them directly. Please remember, time is of the essence, so enter ASAP. Good luck! 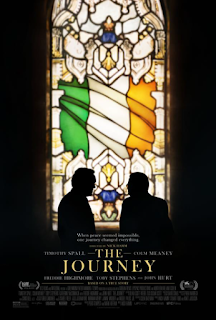 The Journey opens Friday, July 7, 2017. Click here to learn more about the film.